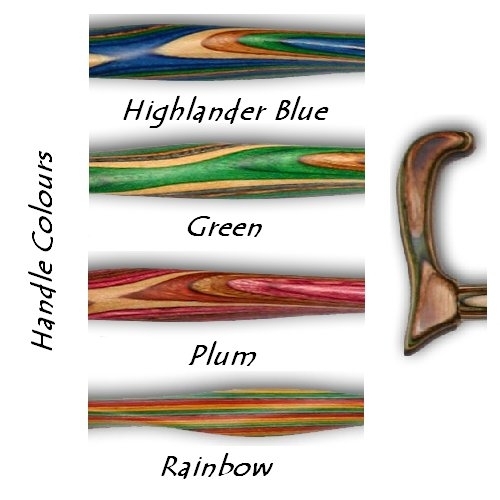 200 - Rainbow Wooden Seat Cane - With a light weight wooden frame and foam covered seat, this seat cane is both strong and comfortable to use. 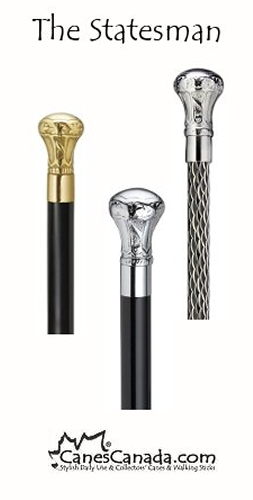 Seat canes are great for camping, golfing, line ups or just for resting while you are enjoying a walk. 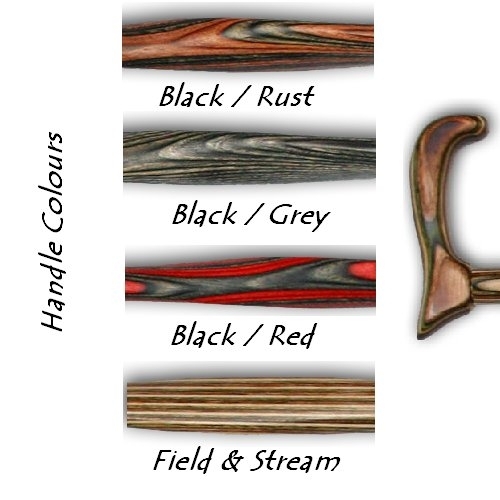 The handles are made from up to 23 pieces of natural wood laminated together in a variety of colours. 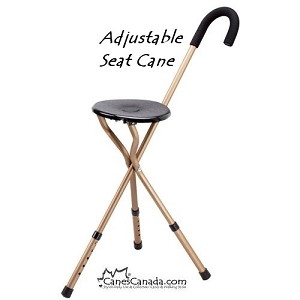 When using a seat cane you must straddle the seat so that the handle is in front. 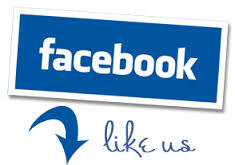 This way you will have a balanced stance while sitting as well as a handle to push up on when standing up. 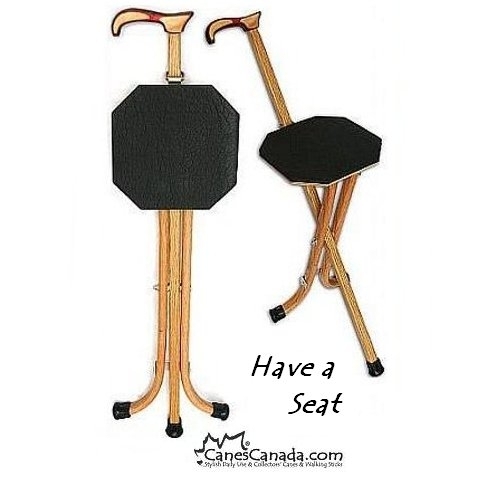 Seat Dimensions - 9" x 9"
*** Please note, the suggested length of a seat cane for an individuals height is only approximate. 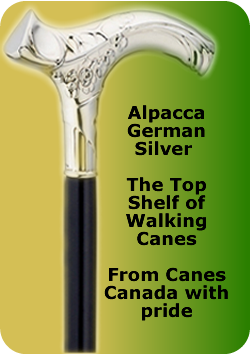 It is best to measure the user to obtain their specific cane height before purchasing a non adjustable seat cane. We loved the canes and they came before we had to go on our trip. We took them on a tour where everyone had to stand for about 30 minutes. It was great we had those canes. We got a lot of looks of ...gee must be nice....lol The tour guide also said how smart we were to bring those along. Love it. It’s gorgeous, works well. Sturdy with my very plus size body. Very pleased with the look and quality of this product. Used it on holidays in Hawaii and it came in very handy. Could have sold plenty. Where'd you get it? While on a Cruise in April, Celebration of Life as well as an Art Show recently so many people asked where's you get it. Many people really thought it was such a well made helpful item. I agree. Could have sold so many at these 3 functions recently. Love my wooden seat can has relieved the ache of walking when I need to rest. Love & trust my seat cane (I'm a heavy person)!!!!! Quick delivery. Lightweight. Perfect for listening to the tour guide. Attracts a lot of jealousy.